Staying in apartments in New York has become increasingly popular. And understandably so: many want to enjoy the city like locals do. Still, I don’t recommend renting an apartment through the ‘marketplace websites’. What are marketplace websites? These are websites where anyone can put up their apartment for rent. There are a couple of well-known sites such as Airbnb. The fact is that it is illegal in New York to rent an apartment for a short term unless the apartment’s resident stays there with you. This, of course, isn’t exactly the holiday you had in mind. So if you do book an entire apartment for you and your family, know that it is illegal. Usually marketplace websites only offer apartments owned by private people who have decided to put their apartment up for short term holiday rental. Another reason why I don’t recommend renting an apartment is that I’ve had a lot of genuine complaints of people being scammed. Either the apartment doesn’t exist at all or the apartment isn’t exactly as the pictures described it to be. Both of these situations can ruin your holiday and cost you a lot of money. In my opinion, if you want to play it safe, then you are better off staying in a hotel in New York than in an apartment. A lot of people want to rent an apartment in New York rather than stay in a hotel because they think it’s cheaper. Truth be told: in most cases it’s not actually any cheaper! The apartment itself might seem relatively cheap, but often you have to pay a cleaning fee as well as a service fee that can make your stay rather pricey. Something you want to also consider, definitely if you are travelling with children, is the safety. Don’t forget that you are renting an apartment from strangers. And what if something breaks or does not work? No hot water or a broken shower will definitely ruin a holiday. If you still want to rent an apartment, then have a look at my selection below. These are apartments that are 100% legal because they are owned by companies who have proper licenses and not by private individuals. 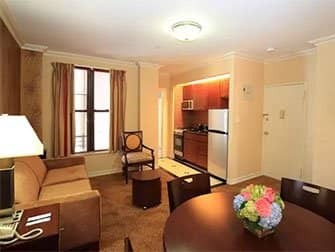 The Radio City Apartments are centrally located, close to Times Square and Radio City Music Hall. There are various types of apartments available, from queen studios to one bedroom apartments. All apartments have a kitchenette and free Wi-Fi. The Superior Times Square Apartments are located in Hell’s Kitchen, close-by Central Park. The interior decoration is rather plain but the apartment is spacious and there is a kitchenette and free WiFi. TEN15NYC Apartments are located in the Garment District. 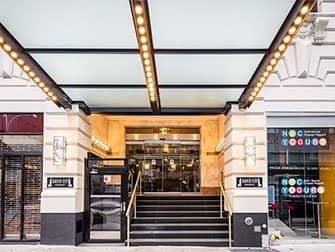 The five-apartment building is just a few minutes walking distance from Macy’s, the Empire State Building and Times Square. Choose from a studio or a one or two bedroom apartment.